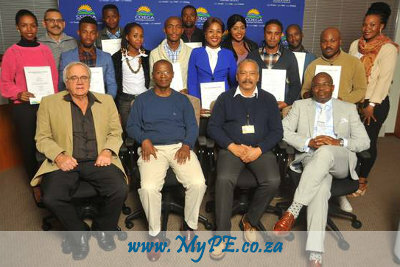 REWARDING EXCELLENCE: (from left to right): Technical Manager: Cost Engineering Unit, Hugh Tamblyn, CDC CEO, Pepi Silinga, Programme Manager (MAQS), Arthur Baatjes and Head of Coega Development Foundation, Mzoxolo Dube, with the twelve (12) graduates of the Clerk of Works Development Programme at their graduation ceremony. CDC held the Clerk of Works Development Programme Graduation for the class of 2018 at their head offices on Friday, 6th July 2018. The graduation marked the end of the eighteen (18) month programme for the participants in which they received certificates as proof of participation in the programme. The programme, which started in 2014, a brainchild of the Coega CEO’s office, was the first of its kind in any South African organisation. The programme seeks to combine the theoretical work done by participants at training institutions whilst equipping them with practical skills training in site management, project management, bricklaying & plastering, plumbing and carpentry to name a few. The success of the programme has seen a zero dropout rate throughout its duration and has managed to attract competitively qualified candidates over the years. This success has thus led to the Department of Higher education along with industries, to scope a program, which will lead to a qualification in the field and present it as a national occupational certificate based on the Clerk of Works framework. Coega CEO, Pepi Silinga, expressed joy at yet another successful end to the programme. “Your stories are precisely the reason why these programmes are more important than the small numbers we are able to assist”, he said. “To me this programme represents a lot more than just the fact that you participate. It gives you the possibility of not only changing your lives, but changing the lives of those around you”, he continued. Richard Tyesi (30), one of the twelve (12) graduates of the programme, expressed gratitude to the CDC on the skills development training received. “On behalf of all twelve (12) of us, I would like to show to you our deepest and most sincere gratefulness because we are more thankful for you giving us an opportunity and investing in us to grow in the paths in which we’ve learned for”, he said. “However I do know for a fact that, I and all of my colleagues, we’re still hungry for more experience for even larger projects than we’ve seen already”, he concluded. Next: Is it better to restore or repair a heritage home?